The Mediterranean diet is not a “diet” in the commonly accepted definition of the word; it’s really a lifestyle. 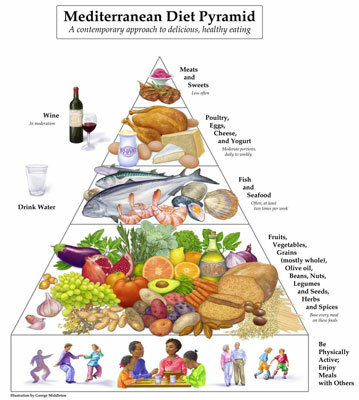 And nothing epitomizes that more than the fact that wine has its place in the standard Mediterranean food pyramid. Ever since the idea of a “French paradox” was observed in the early 1990s, wine and its significance to health have been the source of much research and debate. The “French paradox” describes the phenomenon in which, despite a diet relatively high in saturated fat from cheeses, creamy sauces, and croissants, French people have a lower risk for heart disease. One original theory explaining this paradox is that the presence of red wine in the diet helps ward off heart disease. Since this idea was first proposed, a great deal of information has emerged on the health benefits of including a glass of wine every day. So drink up and read on to discover how a daily glass of wine can be good for you. Red or white? Red, silly head! The color of wine depends on the color of grape used. Red wine is made from purple or red grapes, and white is made from green or yellow grapes. Red grapes and wine have been fermenting with the skin on longer than white, giving them more antioxidants (antioxidants are concentrated in the grape’s skin). One, called resveratrol, is especially important. Red wine has the greatest amounts of antioxidants and has been more heavily researched relative to compounded benefits of the Mediterranean diet. Red wines are classified by body type. In this context, body type doesn’t refer to being pear-shaped or curvy. Instead it refers to the mouthfeel of the wine. Mouthfeel has a lot to do with tannins, a type of flavonoid found in wines (and which can also be found in teas). Light-bodied: Lowest in tannins. Examples include Pinot Noir and Zinfandel. Rosé wine falls within the category of a light-bodied red wine, even though the color is a pinkish hue. Rosé is lighter than red wine because the skins of the grape have the shortest contact time with the juice. Rosés can also be made by blending together red and white wines. Medium-bodied: Moderate tannins. Examples include like Chianti, Shiraz, and Merlot. Full-bodied: Highest in tannins. Examples include Bordeaux and Cabernet Sauvignon. Red wine has the potential to trigger migraines. The exact mechanism isn’t clear, but research shows that tannins and sulfites, chemicals added to increase shelf life, may be two of the culprits. If you’re susceptible to migraines, look for red wine without sulfites and avoid those highest in tannins. Before you raise your glass, take a little time to find out about the antioxidants in red wine and understand how they impact your health. Savoring both the wine and its benefits is all part of the cultural experience. Heart disease: Reduces inflammation, “bad” cholesterol, and risk for clots, and protects artery health. Brain health: Protects against cognitive decline and plaque formation in the brain, reduces inflammation, and may slow the progression of Alzheimer’s and Parkinson’s diseases. Diabetes: May help lower blood glucose levels and improve the body’s response to insulin. Wine isn’t the only drink that provides your dose of resveratrol! It’s also found in varying amounts in grapes, grape juice, blueberries, cranberries, peanuts, and dark chocolate. Quercetin is another flavonoid compound in red wine. It helps widen blood vessels, minimize clots, and reduce inflammation. In addition to being found in wine, quercetin is also found in red apples, capers, dill, and berries. Who says the only way to enjoy wine is to drink it? Wine can add a lot of flavor — without any of the fat — to many recipes. Using wine even lets you cut down on some of the oil you’re using, which is an especially nifty benefit when you’ve already had your allotment for the day. In addition to adding flavor, wine also adds moisture. You can use it to make a mean marinade and to help tenderize meat. You can also use it as a substitute for oil when you’re sautéing or simmering. When you cook with wine, some of the alcohol evaporates away during the cooking process; how much varies, depending on the cooking method and length of cooking time. Choose lighter bodied wines for more delicately flavored dishes and full-bodied wines for dishes with more flavor. Use white wine for light colored dishes and sauces, red for darker-colored meals. Choose a wine you like to drink because the flavor will remain during the cooking process. Dry wine is low in sugar; sweeter wines have more natural sugars and therefore add more sweetness. When deciding which to use, choose the one that produce the flavor you’re craving.